Clemente Marchisio was born on March 1, 1833 at Newport. 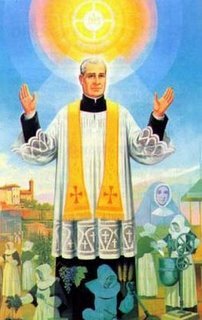 He was an indefatigable priest, first as assistant to change and Vigone, then for 43 years was a parish priest Rivalba Torinese, where he died on December 16, 1903. Roman Martyrology: At Rivalba in Piedmont, blessed Clemente Marchisio, the local parish priest, founded the Institute of the Daughters of St. Joseph. The earthly life of B. Clemente Marchisio is a clear sign that major projects often arise in the most humble places. From the heart of a simple priest Piedmont’s, pastor of a small hill country, rose a still thriving organization. Clemente Marchisio was born in Newport on March 1, 1833. He was the first of five children of a shoemaker. Kind of lively, he received an early education in his hometown. He lived near the church of the Dominicans and went there every day to serve Mass. As a child, he had a great devotion to Our Lady and the Rosary. While it was initiated to take the profession of his father, one day manifested as long felt in his heart: consecrate to God as a priest. His parents, though surprised, were not opposed, even if the first problem was the lack of money to the study. Divine Providence was blessed to meet the future: Don Giovanni Battista Sacco helped him, supporting him also economically. In Bra seminar would impose a very demanding life, centered in prayer, study and work. By papal dispensation, because he was not yet twenty-four, he was ordained priest on September 20, 1856 to Susa from the hands of Monsignor Oddone. The bishop of Turin was in exile in Lyon. After his ordination in Turin, he attended the Biennio further at the boarding of St. Francis. It was the school for holy priests governed by S. Joseph Cafasso, then transferred to the Santuario della Consolata. Clemente was so distinguished that he was chosen by “the Holy Rollers” as companion in frequent visits to prisoners and those sentenced to death. The two years at the side of Cafasso profoundly transformed his mood. He said: “I uscii completely different, fully aware of the dignity of the priest.” Subalpine in the capital were the years of Don Bosco, S. Leonardo Murialdo of B. Albert Federico, of B. Michele Rua, of B. Francesco Faà di Bruno, of B. Giovanni Maria Boccardo, was alive the memory of Cottolengo. In 1858 he was named assistant to change, but the frankness in denouncing certain situations, the attorney for expulsion. After a short period Vigone, his ultimate destination was Rivalba Torinese, a small hill to where even thousand inhabitants made his admission on November 18, 1860 just twenty-seven years: stand the parish, spending his life without reservations, for forty-three years. As S. Paul’s faith without works is dead. They were the years of crisis campaign, we emigrated to cities in search of fortune. To meet his parishioners Don Clement gave life to different initiatives. The unused building materials for non-construction of the new church were used to build a kindergarten and a textile workshop for young people who were not forced to travel to Turin in search of work as domestic servants (1871). He also redesigned the millennium castle (now the cradle of his foundation). A turning point came when the Albertine nuns, who had managed the first laboratory, left the country. On the advice of the Archbishop of Turin Mons. Gastaldi, Don Clemente gave him some of the best girls who were involved. It was the nucleus of a new religious family: the Institute of the Daughters of St. Joseph (1877). Rosalia Sismonda known two years before a Sciolze, would be his right arm. His parishioners realized that their pastor had really uncommon quality. His attention to the poor and the sick continued, the doors of the rectory were always open to everyone. He had a deep faith for the Virgin. During the day, every hour of sound, recommended to entrust to the Virgin Mary for the grace of purity. He went to Lourdes in 1875, before the foundation of his institute. Each time he was in Turin went to Consolata, for special thanks visited Oropa, when he went to Rome he visited Loreto. In 1894 he collected his thoughts and his meditations on the Eucharist, and the fight against it, in the book “The SS. Eucharist fought by Satanism. ” The his hands distributed during the Second National Eucharistic Congress in Turin, which was held in the presence of fifty bishops and numerous priests. Commenting on the Apocalypse, Don Clemente illustrated the continuing attempt of the devil to remove the man from the sublime moment of his union with God on earth: the Communion. Bringing God to man was the center of his thoughts. To achieve this goal it was important that the Eucharist was celebrated so unexceptionable. The bread and wine had to be prepared with a careful selection of flour and grapes. For this reason, the Daughters of St. Joseph opened several laboratories throughout Italy: the work to be done was immense. The activity of B. Clemente was intense, pilgrims in many parishes for missions to the people. To disseminate his work, he traveled all over Italy, collecting certificates estimate anywhere from bishops and cardinals. Among these also the Patriarch of Venice, the future Pope S. Pius X. He reached the age of seventy years and was ripe for heaven. He celebrated his last Mass on the morning of December 14, 1903. Throughout his life he said “Mass is my life.” He died in his Rivalba December 16, muttering the names of Jesus, Joseph and Madonna. He had done in practice, until the last, as he had often repeated to his sisters’ Next, faith, humility, obedience and never any sadness. Never despair. ” His “daughters”, scattered across the peninsula, were over six hundred. His friend S. Pius X officially recognized the Institute in 1907 and wanted it for the sacristy of S. Peter. Today, as well as the preparation of the hosts and wine, the Daughters of St. Joseph deal with catechesis and liturgical animation, even in a land of mission. Beatified by Pope John Paul II with Richard Albert, a priest in Turin, September 30, 1984, his remains are venerated in the parish of Rivalba. dedicated to honor and decorum of the SS. Sacrament of the Eucharist. the grace that so implore. This entry was posted on Tuesday, December 16th, 2008 at 1:58 am and is filed under Catholic. You can follow any responses to this entry through the RSS 2.0 feed. You can leave a response, or trackback from your own site.